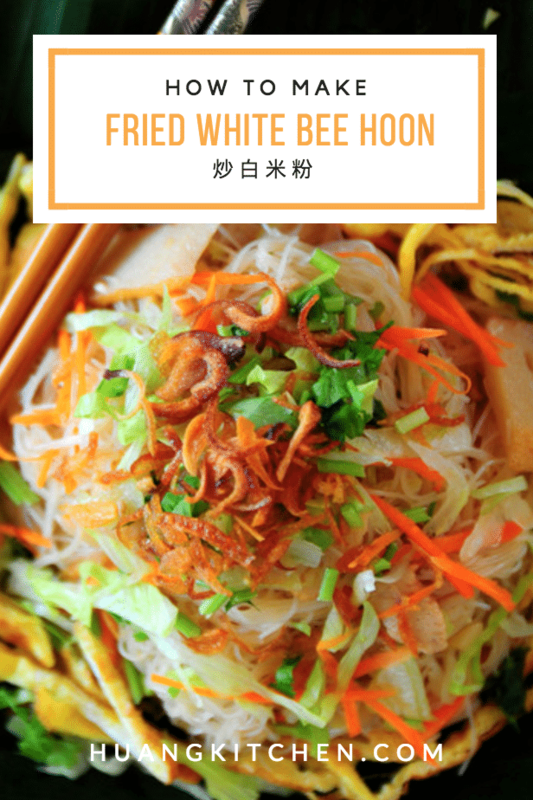 Fried White Bee Hoon is such a delicious one meal dish that you can whip up in a jiffy. 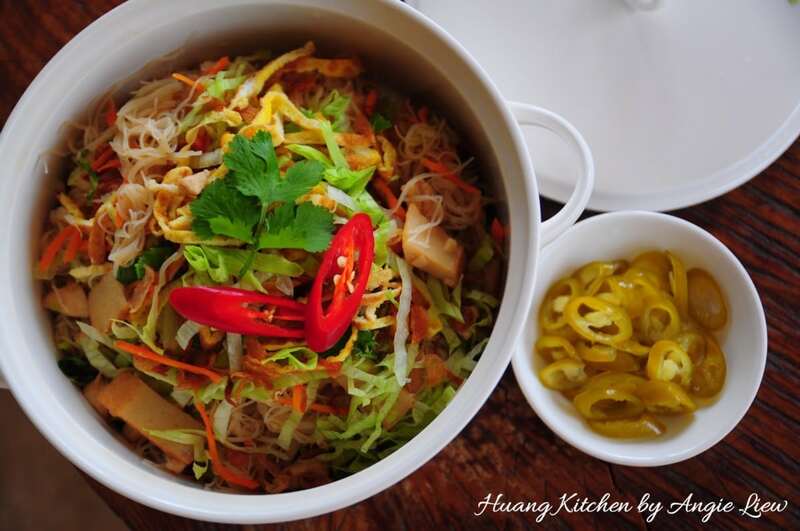 A combination of rice vermicelli with vegetables and meat, it is very well flavoured and healthy. And you know what, it may just be the dish you want to bring for parties or family gatherings too. 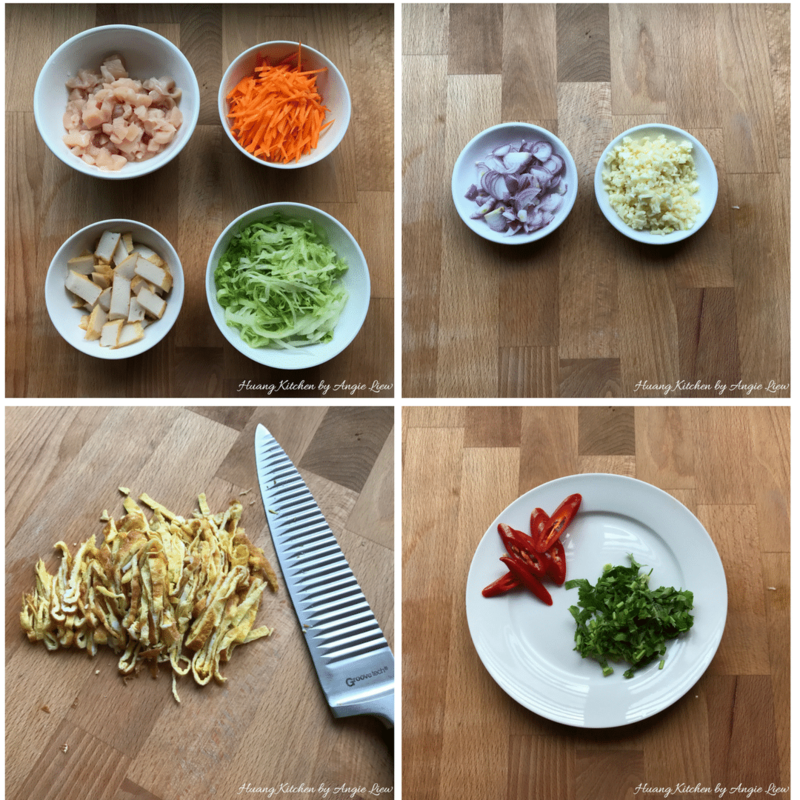 To cook this mouth-watering Chinese-style stir-fry Fried White Bee Hoon, all you need is just a wok or a skillet, some vegetables, meat or even seafood and of course, the secret ingredient … fish sauce. 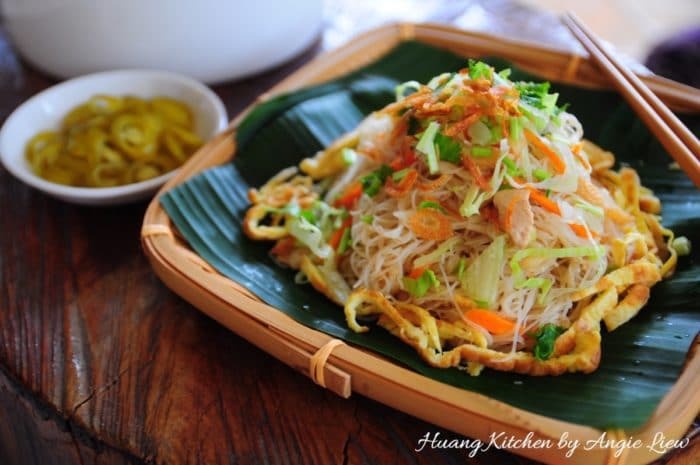 Fish sauce adds a lot of flavour to this otherwise ordinary taste of fried rice vermicelli. This awesome looking and tasty noodles can be served on its own with your favourite condiment and for me, its of course my homemade Pickled Green Chillies (click here to see recipe). A simple yet absolutely delicious fried rice vermicelli, filled with the aroma of fish sauce and a variety of ingredients. Definitely a crowd pleaser and a great one meal dish too! First, slice shallots and mince garlic. Then dice meat, slice fishcake and cut vegetables into long strips. Lastly, chop coriander leaves, slice red chillies and egg omelette for garnish. Marinade dice meat and soak the dried vermicelli in water for 30 minutes. Also mix well the seasoning ingredients. And we're ready to fry the rice vermicelli. 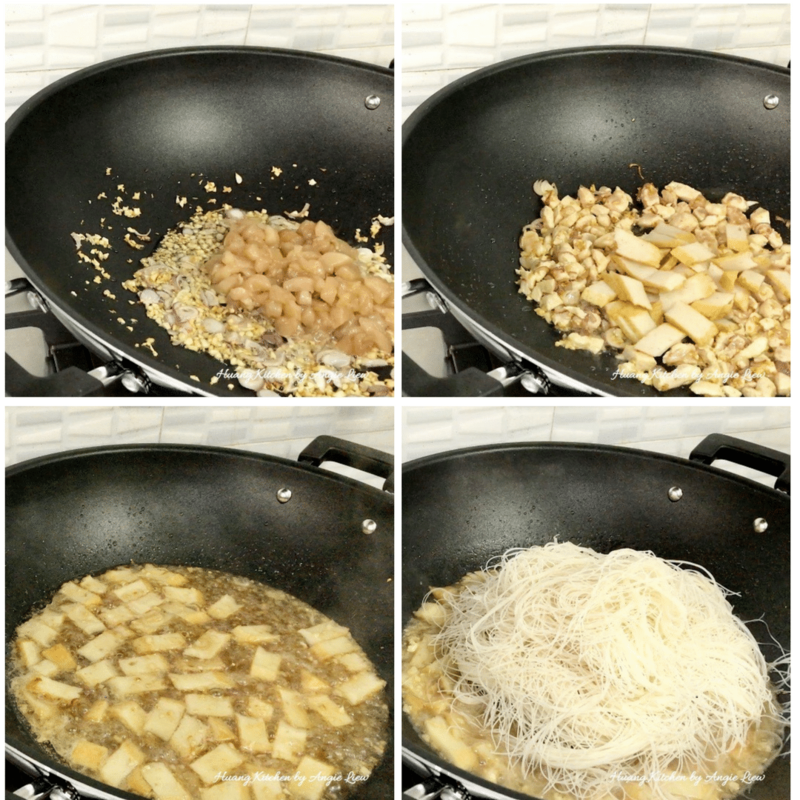 To fry the rice vermicelli, heat up 2 tbsp of vegetable oil in wok over high heat. 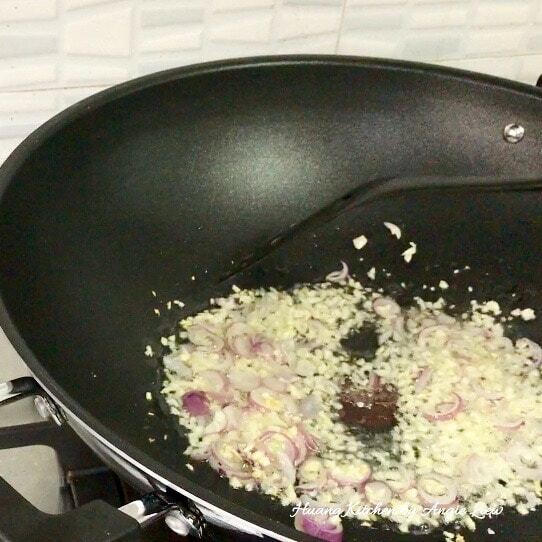 Stir fry sliced shallots and garlic until fragrant. Then add in marinated meat and fry for another 2 minutes. Toss in sliced fish cake. Next add in the seasoning broth and bring to a boil. Adjust seasonings to taste and let broth boil for 5 minutes. Add in rice vermicelli. 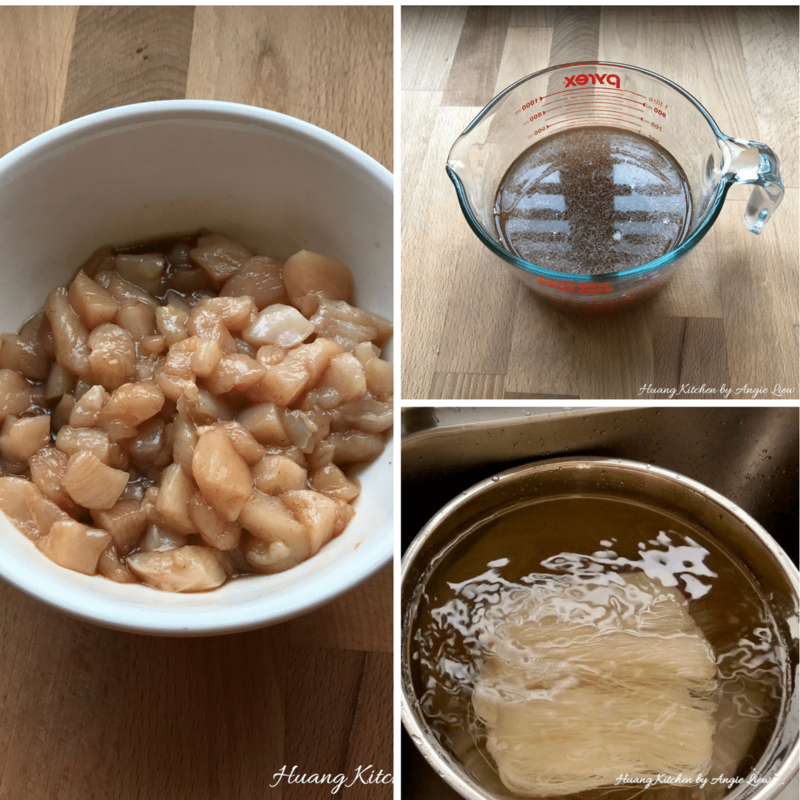 Stir gently to mix everything together. Reduce heat, add in carrot strips and sliced iceberg lettuce. Toss to make sure everything is well mixed and the rice vermicelli has absorbed almost all the liquid. And we're done! Transfer to serving casserole immediately and garnish before serving with pickled green chillies. (See recipe here: http://www.huangkitchen.com/pickled-green-chillies/) As always, Enjoy! Begin to soak rice vermicelli in water (cold or warm) before you start to prepare the other ingredients and you will be ready to fry the noodles when the other preparation is done. Do not soak and cook rice vermicelli for too long. Also, do not add too much liquid. Otherwise the rice vermicelli will turn too soft and will break and be soggy. 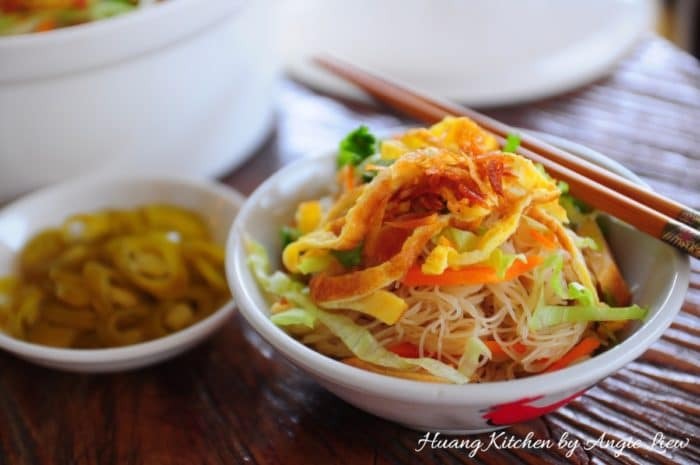 Any other kinds of meat and vegetables can be used to fry the rice vermicelli. Never stir fry the rice vermicelli together with the vegetables or meat or the noodles will stick to the wok or skillet. Reduce the amount of salt and light soy sauce if serving the rice vermicelli with curry dish. 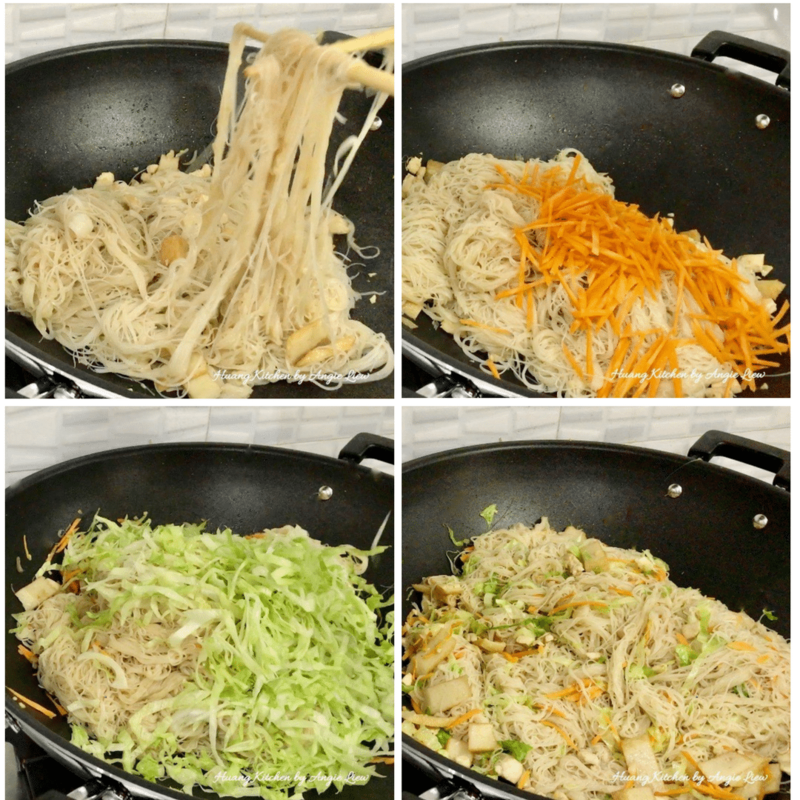 If frying a huge quantity of rice vermicelli, fry in batches to ensure even mixing and flavour.